No longer limited by wood, WNG has created action parts that are highly customizable, adaptable, and able to meet almost any rebuilding need. Taking advantage of the advanced composite material’s design flexibility, WNG’s engineers have moved the repetition’s center of gravity towards its center pin. This shift dramatically reduces the repetition’s rotational weight and makes it much lighter to play—a feat that would have been impossible to do using wood. Both WNG's jacks and composite jack spoons are felted, helping to make the action as quiet as possible. 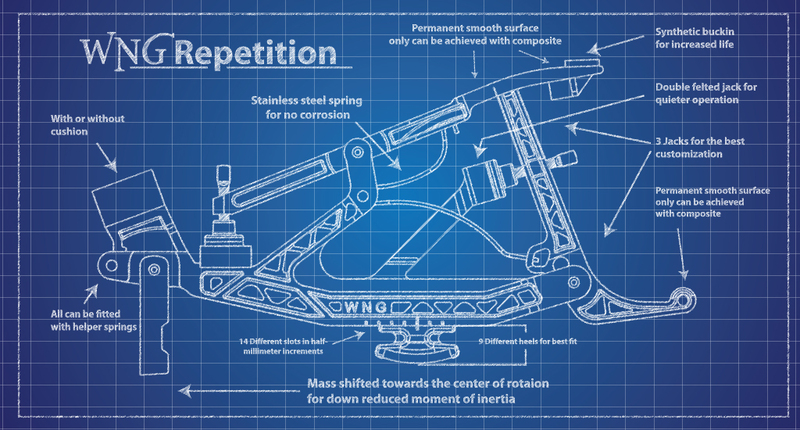 WNG has developed and integrated several systems into its action parts that not only make them adaptable to almost any piano, but also empower the rebuilder to solve a myriad of action geometry problems. In addition, these systems also make it possible for a pianist to request a very specific touch or feel, and the rebuilder can easily fine-tune the piano to the pianist’s exact specifications. Wessell, Nickel and Gross' 9 different heels have 14 available positions in 1/2mm increments—an incredible 126 possible combinations. WNG’s optional attachable cushion is just that—optional and attachable. In traditional actions, if you needed to add a cushion you would have to purchase an entirely new repetition, or if you wanted to take it off, you would have to make an irreversible alteration to it. WNG’s cushion system was specifically designed to address this and is able to be removed or attached without damaging the repetition. WNG offers three different jack sizes that are compatible with the vast majority of available pianos. To provide the best power transmission in the bass and enhance the sustain in the treble, WNG’s epoxy-carbon fiber shanks are slightly thicker in the base and a little bit thinner in the treble.